Are you a man or a woman? Would you live like a soldier, power and dominance of the regime? Knowing what is the real strength and organization of the group? You love that feeling of invincibility and victory? Logistics and immediate response in the sense of immortality? Tired of you mere civilian life and the whole world to you seems too small, simple and yet unrecognized or vice versa? Therefore, becomes a soldier of the Imperium of Diamonds, and together we will serve our country Imperium of Diamonds together for safety in the world! Women's, Man's, Migrant's and Refugees, new Citizen's, all people have open ! The Soldier's ID, means many opportunities for growth in your life and the opening of many new directions for development and knowledge. Living with friends, a solid team, military camps and training centers, military authorities and the International military communications, civilizing activities for the organization of International markets and the development of military industry and special forms of technology, intelligence, strength of armies and life in the real world. Cooperation for our country, and cooperation with the other armies in the world. Development of new Military Civilization's in Universe and support grow of our strengh into form of Global Superpower ! You get a good financial gains, military education, benefits offices, full protection for your family, earlier retirement and insurance, better house for a family, consumer rebates and support for employment for family members, financial sponsorship and quality education to the training of your children, subsidies for founding family corporations, and also advantageous position to start political activities. Pride in the country and state recognition. Great step for Your carier life, strenghening, and position's for Your Families ! Together we will establish military training centers and industrial zones, our goal is to expand the (legitimate) International trade in weapons and expand new bases worldwide. Our goal is to ensure the formation function of the military authorities. Create military diplomatic relations. Our first goal will be the development of shops and protection for our traders and corporations, protection civilian members and policy. An Important measure is the development of military bases in our country, and abroad, in international waters and also in space. Mobilization of the secret services and the infiltration of terrorist organizations. Special training centers for espionage, aerospace, organization or military service, and special military units. The Research of military technology and the development of science, establishment of military research centers. Development of military space ship for journey beyond the horizon of the observable universe. Loading military civilizations of the size of the entire planet in cosmic space. Many steps and possibilities that life as a civilian can not know. Every soldier goes through military training and education of military rights and obligations. Soon you can shape into units, or get a better position to grow and improve your career and expand your life and significant experience that have will always remain above civil society and in the area of ​​policy and information and active centers intelligent society, and center of civilization. Tactical Force, Land formations, undersea units, air units, cosmic forces, industrial forces, intelligence and military police, or can also be a colonel or general and Reprezent own department Military planet anywhere in the universe. Living into offices or in military guards. Service in the armed forces ID's in a convenient honor and a significant opportunity to further your career growth. Your service to our country and civilization for you to create a position of significant personalities who thus gains greater social and legal support. Logistics Government Imperium of Diamonds ability to ensure that each of our member could make active use of distance education at secondary school level, together with the universities. In the phase of full economic function of each member receive subsidies for self-study and legitimate education. In any case, you get your own business corporation, but then you can work on the military authorities, or the authorities additional security and logistic structures. One day you gain as Interior Minister, Army and Police or Military Police. Your effort to increase the chances for creating great opportunity to become a senator of the Federation, or get right to the establishment of a new federal entity Imperium of Diamonds, and therefore the developed your own civilization as a civilization over 100 planets around a single star. If you want to take advantage of these offers, so do not hesitate and join us soon jointly we create advanced infrastructure and expand our position. Send bid for your friends, sustain their favor and bring as many people as you register special rewards! Create a group of at least ten or more people, both men and women, or get more than one hundred members and expand your regiment! Soon it adds more regiments, and we immediately, create an office function and development of military infrastructure. The First objective is to create a contact center coupling between the strong-willed, we will continually gain new strength and relatives. We create a military camp, barracks and training center. Extend the sales network of industry and finance, we will support the military operations of the Bank. Soon we will be producing a spacecraft traveling to other galaxies, we'll create our bases at strategic locations. Every one of You can have a Great Life ! Establishment of Council of Autonomy, creating contact persons and organizers of the movement to gain new members. Manufacturing of flags Federation. Ensuring friendly and diplomatic relations with the local government sovereignty declaration on the right of extraterritoriality in line with UN principles. Each self-contained unit must be based on coordination with the central government's department ID, and the establishment of a joint management. Create a common management system for managing inside information and isolation from the public. Distribution logistics functions under budget. Federal Communications department. Department of Investigation and against monopolies. The department organizing events to gain new members (legal way). The Department of local markets. The Department of International markets. The Department of science and research, industrial building. Department of Health. The Main body of government troops. The main principle is to verify the identity and security for each member, and also organize repeated interrogations. Infrastructure cooperation can provide sufficient funding for the use of printing technology detectors, along with other technologies for some questioning. Primary step, use of new members in order to create new local boxing clubs, airsoft, extreme sports, basic commerce. Establishment of infrastructure for clubs and centers through our own network of members, or the development of friendly and commercial contracts between urban businesses. Profit basic finance for the opportunity to organize and develop, as well as the ability to ensure the role of the Authority and active communications networks. Goal is to get mostly new soldiers and members of the military official service. Furthermore needed to obtain businessmen, scientists and researchers, engineers, health care workers, laborers. Construction of the camp, creating a central position, format of every base camp is, barracks, training centers, food stores, hygien center, warehouse materials, simple industry. Development strategy of International trade, establishing corporations for metallurgy, foundry, electronics, pyrotechnics, radar technology, aerospace, and other. Creating your own land transports, create your own Intercontinental transports, transports create of own space and universal equipment. 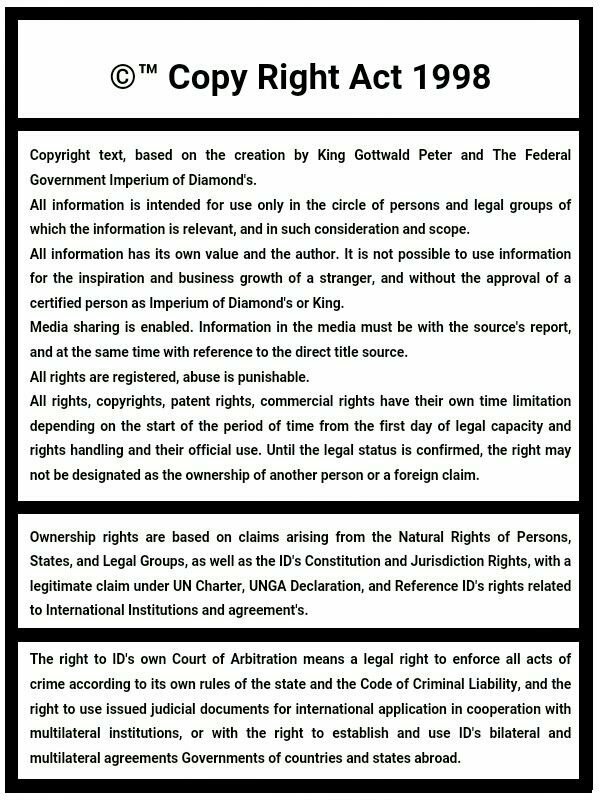 To create a corporation is the ability to use strategy of double citizenship, Global Citizen passport, Offshore stores, or directly establish a corporation and its headquarters on the territory of the Imperium of Diamonds, N-E Africa, so with the full capability to develop Internationally, as well as the opportunity to use strategies to Consortia among the rest of the traders. Establishing business contracts or creating profit centers for their own material, textile industrial zones, production of flags, production of business suits, uniforms and military fatigues, sleeping bags, backpacks, tents, tarpaulins, camouflage tents for tropical and cold form the field, and other basic facilities, autonomously employment of staff. The Subsequent step is the development of farms, autonome employment of its own employees, the creation of autonomous breeding of plants and animals, industrial raw materials. Sales of production, payments to the office and staff, investment projects, investment in the next cycle of Agriculture and operation of the farm. In order to structure our group, purchase prepared foods from certified and safe Market. The Main objective of the group is to create your own camp, initiate training activities and search new members. Autonomy Act shall terminate immediately in the full capabilities of coordinated contact with the central administration of the military department. Register of all members of the information and regular contacts to insure the identity function without blocking them from the enemy. In the event of a discovery and imprisonment, then immediately act common response is to attack all the prisons and opening the doors of all prisons. Distribution functions of offices and logistics capacity as organizing committees function and extension departments and multi departments Global logistics. Activating the function Military Bank. Educational centers of Requalification with High-School and Universities. Social organization and cooperation with organizations, agencies and alliances. Loading exile and extraterritorial or offshore centers, consulates, centers of civic associations and business center for the possibility of our communications and logistics stability. Organizing business and commercial conferences, political rallies and movements. The Establishment of our own infrastructure industry. Manufacture of weapons and military equipment, telecommunication technology, spacecraft, spacecraft, expanding the military and industrial bases in International waters while on the territory of the other planets. Our own military technology and market strategy for the purchase of technology from foreign markets (beneath the legal principles of the registry and for peaceful purposes). Developing research centers, military hospitals, running camps for training. The Main objective of the training are Cosmic forces, Special commando units, Industrial logistics forces, Defense interim, Planning, Legal activities and Official logistics, Medical assistance, Training centers. One of our primary goal is for Support all states in disasters, ensuring the safety functions during conflicts. Growth peace policy and the organization of International cooperation with the other governments of countries. Soon, our strength will be the world superpower! For the purpose of peace and dominance against crimes! Each of us will stand because to win!